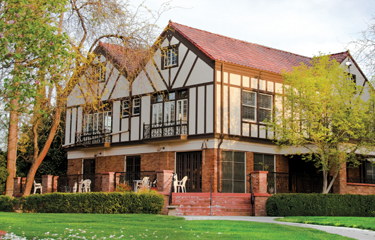 I attended graduate school at an enchanting little place called Fresno Pacific University in California. The school’s Mennonite roots reach their ideology of peace throughout their curriculum. I’m not talking about “stick-your-head-in-the-sand” kind of peace. I’m talking about the “let’s-face-one-another, wrestle, and-learn-to-live-together-in-spite-of-our differences”, hard, honest, and sometimes messy kind of peace. I became a wife and then a mother in this environment, navigating two of the more challenging albeit joyful transitions of life in the arms of this tiny community. My professors were strong, smart, and gentle men and women. Their commitment to training good therapists who were also Christians was expressed in how the form of the education matched the content. They lead by example, asking us hard questions about ethics, practice, and theology. As long as we were seeing clients in our practicum, we were required to be in our own therapy with a well-trained therapist. They gently and firmly stretched us and sometimes I fought it. One professor, Dr. Rose, was more gruff than gentle and made our knees tremble a little as we approached his class, the capstone of our graduate experience. He was a clinical psychologist who taught our practicum class, that class that oversaw our first workings with clients. Each week a student’s name was drawn out of a hat to be the one who presented a case from their client load. Afterwards, Dr. Rose would drill the poor student on what could have been done differently…the whole time with a straight face and deep sighs. It was a nerve-racking experience. I started these classes with Dr. Rose when I was 8 months pregnant. I was heading into a semester with a full load of classes, seeing clients for the first time, on the verge of becoming a mother. You are absolutely right. I had no idea what I was doing. In one of the first classes, I took the plunge and decided to answer a question Dr. Rose posed for us eager beaver, wet behind the ears, clinicians. My answer got a stinging response from him. Apparently, I was an idiot. I was tired and overwhelmed in every possible way. I was thousands of miles away from home and confused about what my life was about to look like as a new mother and here this, this, this BARBARIAN dared to embarrass me publically. What I experienced as condemnation in front of my classmates was just a little too much for me. My blood froze and I didn’t hear anything else in class that day. When I got home the ice in my blood had thawed, heated, boiled, and then turned to electricity running through my veins. I had to do something. I was hurt and angry and embarrassed. I could not believe he had ridiculed me like that in front of the entire class. He was a bully. I had to stand up to him. I couldn’t let him get away with this. Something had to be done. For the sake of future students, of course. So I wrote him a letter. Well, an email. I can’t remember what I said to Dr. Rose in that email and I am glad I cannot. I spewed all over that computer screen, all of the exhaustion, hurt, and confusion hurling out like the screams of a woman giving birth. Then I hit “send”. Immediately, I was stricken with fear. What had I done? Good God, what would happen now? How would I go back to class? What would he say? And, what’s worse, what if he said nothing? I stepped into class the next week with a woozy stomach that had nothing to do with expecting a baby. I was afraid to glance towards Dr. Rose. I thought I would pass out with shame. Why had I not just let the whole thing go? As Dr. Rose opened up class, my heart was beating hard. He said he needed to say something before we did anything else. He looked at me. Oh, God. I was stunned and felt incredibly vulnerable. I wanted the moment to be over. I thought it would feel good to get an apology, but accepting the apology was as painful as experiencing the offense. I had expected a stony silent treatment and weeks of walking on eggshells with him. I had not expected a simple, honest, straight forward apology. He never mentioned the email. He never brought it up again. We both put it behind us. He didn’t treat me differently. He was still gruff and serious and firm about us being clinically sound therapists. But, when I broke down in tears 8 weeks after having my first child in the middle of my program and wanted to quit, he and another professor was there with me. He made room for the messy birthing of a new mother and a new therapist. He gave me room to quit and then room to try again, never telling me what to do…he was just there. Dr. Rose introduced me to some of my all time favorite books and authors, including Anne Lamott with her book Operating Instructions, which helped me realize I was, in fact, NOT the craziest mother on the planet. And, when I had my “discernment” meeting, which was a requirement before a student graduated, I invited him as one of my professors. He accepted. In the sacred space of that meeting, he expressed concern about me finding room to be myself while also being a minister’s spouse and a therapist, two difficult identities in their own right. And, then I sat down in the midst of peers and professors with my husband at my side and this barbarian, this bully, prayed over me as I finished my journey at that school. This is what I think. I think that Dr. Rose is not a barbarian. I think he isn’t a bully either. Maybe he was rude to me that night and maybe I did deserve the apology. But, I think Dr. Rose knew that the email I hurled at him had way more to do with me than with him. Something shifted in me that day when he apologized and didn’t punish me for my anger. It was what some therapists call a “corrective emotional experience”. As a professor and as a therapist I am often in complicated, hard discussions with hurting, even angry, people. When students write me angry emails about a grade or if a client gets hurt in a session over something we have discussed, I take a deep breath, and model Dr. Rose (the barbarian). I don’t react to their anger or hurt. I let them feel that way. I acknowledge it. I try to help them determine the cause or problem. If I had a role in the situation I apologize sincerely and directly. I remember that this anger, this hurt has way more to do with them than with me. I am better at applying this technique with students and clients because I am not in a long term, day to day relationship with them. But, I wonder…what would happen if we all tried to do this…offered people corrective emotional experiences. I wonder what would happen if we all took time to acknowledge hurt and anger, help to determine the cause, apologize if we have a part in it. Sincerely. Directly. No laughing. No qualification. No jokes. No sarcasm. I apologize for doing that. I was wrong. I am sorry. Then we move on. We can love and be loved and not have to dance around issues and pain. I, and my own tendency to react and lash out because of my own defensive, self-righteous indignation and need to defend, must decrease and He, with all of His love, patience, healing must increase in this person’s life right now in this moment, in this anger, in this hurt. I can be part of that. If I choose to let go of my own need to be right or in control or whatever else causes us to react in anger or turn to stone and silent treatments when someone expresses anger towards us. This is not easy, mind you. It takes a willingness to be aware of our own wounds because often the reason we react to a person’s anger, hurt, or snubbing is because the other person’s anger, hurt, or snubbing has grazed over a tender spot of our own. You know what happens when a person’s wound is touched. You react. You jump. You pull back. You cry out. So, the next time a person in my life gets angry or hurt or snubs me, instead of defending myself, I want to listen. I want to make room. I want to decrease. I want His love to increase. Which is patient. Kind. Not easily angered. Not self-seeking. Keeps no record of wrongs. Never gives up. On him. On her. Or on me. Oh Emily… good. good. good. I really liked this and it gave me a lot to think about. As iron sharpens iron, you are a blessing! Oh my goodness, Emily. How many times are you going to insist on making me cry over my keyboard at lunch? Sooooo good. And also? “Operating Instructions” is delightful. My introduction to the lovely Annie Lamott was through Stacy Isom. Professor Stone, I will try and use that decrease approach when my wife snubs me when she is easily angered!